L.A.Eyeworks was a featured sponsor at this past weekend's Young Hollywood Mansion Party in the Hollywood hills. At the swanky event, David and Toni from the Melrose store helped represent team l.a.Eyeworks and were snapped by photographers all night! 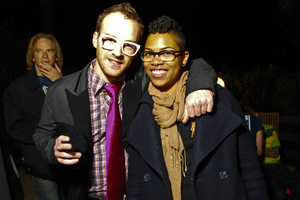 Here, David is effortlessly wearing Bent in creamora latte, and Toni parties with her Fiction by l.a.Eyeworks frame xl. This image was taken right before the midnight fashion show was heating up the outdoor tennis courts. Stay tuned for more updates from the night, and some fierce footage of l.a.Eyeworks on the runway! Also, be sure to check out the Metro Mix website to see the funny caption that was added to David and Toni's photo!